The beautiful Trinity Cathedral, located on Euclid Avenue, is a historic landmark that is home to the oldest congregation in Cleveland. The church welcomes couples to use its facilities for weddings and sacred unions. Built in 1901 and added to the National Register of Historic Places in 1973, Trinity Cathedral’s picturesque spaces include a gothic nave, state-of-the-art conference center, botanical courtyard and art gallery. The cathedral itself features neo-perpendicular Gothic architecture with stunning stained glass windows and a carved wood ceiling. It can accommodate up to 300 seated guests or more than 500 standing. The cathedral hall includes exquisite décor highlighted by rich woods, intricate chandeliers and ceiling-high windows. Its stage and 2,500 square feet of open space can accommodate 150 seated guests or 250 standing. Another exceptional space at Trinity Cathedral is the art gallery, which houses exhibits from the archives of Trinity Cathedral and artists from the Episcopal Diocese of Ohio, among others, on a continually rotating basis. This space is able to hold up to 125 guests and is perfect for an elegant and sophisticated reception. Couples who wish to get married at the cathedral must have at least one of the parties baptized as a Christian. Trinity Cathedral blesses the sacred unions of same-gender couples using liturgical materials in keeping with the developing practices of the church. Its all-inclusive package includes use of the cathedral space “as-is,” three sessions of premarital counseling, consultation with the director of music and worship, aisle candles, bridal party dressing room, coordination with the associate for congregational life, organist, clergy, setup, cleanup, standard leaflet for up to 200 people, parking for up to 125 cars and building opening and closing. 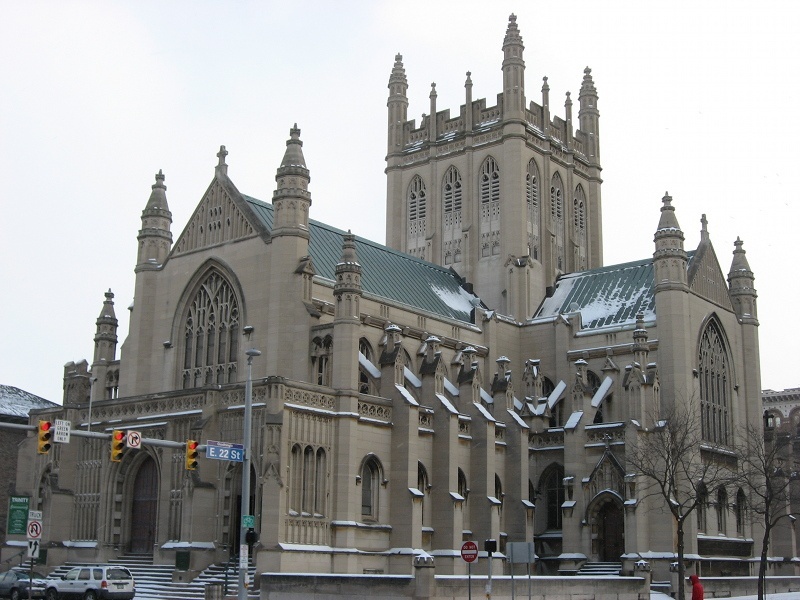 The cathedral, which was downtown Cleveland’s first green building, is the cathedral of the Episcopal Diocese of Ohio, which comprises more than 24,000 Episcopalians from 103 parishes in the northern half of Ohio. It is also the seat of the Bishop of Ohio, currently the Rt. Rev. Mark Hollingsworth, Jr.
For more information on Trinity Cathedral, 2230 Euclid Ave., Cleveland, OH 44115, visit trinitycleveland.org or call (216) 771-3630.